Here’s what our readers had to say about Bears Ears designation, new homeless shelters, Temple Square lights and more. 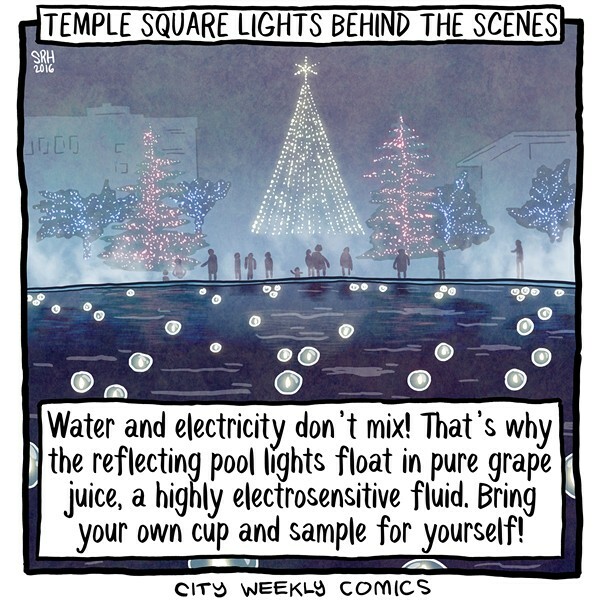 Comic, Dec. 23, "Temple Square Lights Behind the Scenes"
Who knows what animal wastes, airborne chemicals, etc., are in there. I recommend you do not "bring a cup." Didn't get the joke? Eh fella? And you will be allowed to have and see visions. If you don't believe me just ask the profit [sic]. I love the grape Kool-Aid idea. Blog, Dec. 16, "Residents, business owners express concern over proposed shelter locations"
Everyone wants something done but no one wants it near them. It's part of a growing city. Tough, but change is inevitable. Meh. While it will placate the business owners in the area of the current shelter, it's just shifted the burden to family neighborhoods and eliminated 500 needed beds. Not sure how this can be considered a step up. I'm all for trying to help people that wanna help themselves, but let's be real here for a second. A lot of these folks down at that shelter are drug-addicted criminals that have no interest of helping themselves and only take advantage of the current system that's in place. For those that think this comment is uncaring, rude and outta line, perhaps you should go down to the shelter now and just take a walk around it once or twice. ... Needless to say, I'm happy that I live nowhere near that shelter or any of the new proposed locations nor would I welcome one in my neighborhood. I think it's a good first hard step that apparently no one else has the balls to do. The county and the state should have been addressing this years ago, but, you know ... Who cares? ... Just don't bother us out here in the 'burbs. I don't agree with the mayor's lack of transparency, but at least she is doing something, which is more than I can say for any other elected official in this "pretty, great" state. The unilateral and dictatorial manner in which this decision was made is unacceptable and the situation has been further aggravated by the ridiculous excuse the Salt Lake City Council and the mayor have proffered for this behavior. The idea that they seem to feel they were elected to do what is best for us, whether we like it or not, is frightening. Cat is an awesome person! I'm glad to see her get some well-deserved recognition. I was both shocked and disappointed by the news of the Mormon Tabernacle Choir's upcoming performance at the inaugural ceremony of President-elect Donald Trump. It is wrong on so many levels. Trump's sexist and degrading comments regarding women and minorities, his shady business dealings, and the garish, uncouth way in which he conducts himself are antithetical to Mormon values. Performing for Trump would be an implicit endorsement of him, which is extremely problematic. It sends the message to youth and potential converts that the church condones sexual assault, unfettered greed and anti-immigrant nativism. To set a good example, the choir should do the morally responsible thing and withdraw immediately. After witnessing the nightmarish end to the quest by the University of Utah's football team to finally break through to the top in the PAC-12 football standings, I had a restless night. My sleep was interrupted by a vision—a ghost of a Ute Indian tribal elder. He stated that the Utah Ute tribe has always honored the environment and the earth, and it was part of the foundation of their culture—a fundamental part of their lives and heritage. He said their leaders from the past were extremely disappointed to see the university that bears their name turn their backs on this principle with the way the administration treated internationally renowned naturalist, writer and teacher Terry Tempest Williams, who went so far as to purchase at great expense to her personally a tract of land to be utilized as an outdoor classroom, creating a never-ending generator of energy that would honor and fuel the ideals of environmental education and protection. He proclaimed that as long as the university continues on this path and does not rectify the situation with Ms. Tempest Williams—much like the The Curse of The Bambino with the Boston Red Sox or the The Curse of the Billy Goat with the Chicago Cubs—it will be a long and torturous road until the university's sports teams reach the heights they envision and desire. Five Spot, Dec. 8, "Santa Ed"
We were fortunate to have Santa Ed be the center of our holiday party for three years. He was the most realistic and loving Santa. He will be greatly missed.